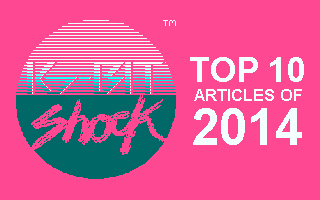 My initial foray in pixel art was with a nifty little program called OCP Art Studio on the ZX Spectrum. Generally an easy-to-use pixel editor that truly deepened my interest in the art form. In subsequent years as I upgraded to new computer hardware I was always on the look out for similar graphics software. When I got hold of my first IBM PC compatible I started using another drawing program called Dr. Halo. Essentially a Macpaint wannabe for DOS-based systems of that period. It lacked some of the charm of OCP Art Studio but it was competent enough for pixel pushing. 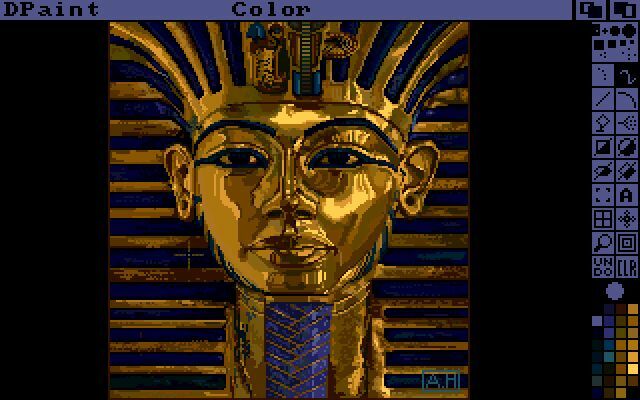 Eventually I switched to Deluxe Paint II, a port of the original Commodore Amiga version. I liked this one quite a lot, an impressive and professional package that I still use on occasion. 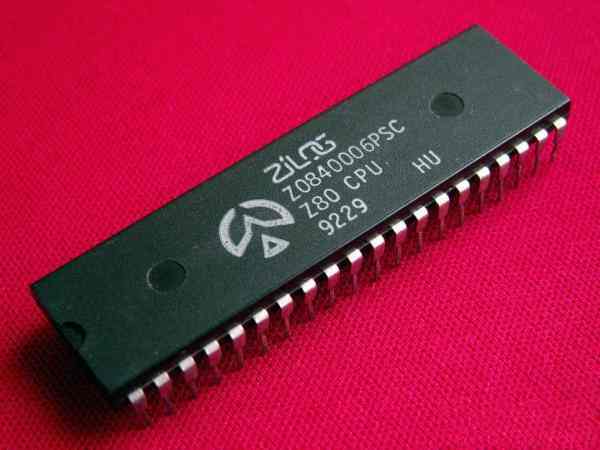 As I moved onto Pentium hardware it was time to make another switch to a more advanced art application. I went with Paint Shop Pro which I thoroughly enjoyed and significantly improved my pixel art capabilities. Somewhat limited when compared to Photoshop but definitely better as a pixel editor. When Gimp came to my attention I used it in tandem with Paint Shop Pro and worked on some HD-quality pixel art. Yes, pixel art at a resolution of 1280 x 720 which was completely nuts but it helped me improve my detailing. Three years ago I discovered GraphicsGale and quite honestly have never looked back. This is the absolute best pixel editor I’ve ever used and I think I speak with some degree of authority. Incredibly intuitive to use without any unnecessary features that often impede the creation process. GraphicsGale is all about the pixels and nothing but the pixels – just the way I like it! Sprite animation and onion skinning are also features of GraphicsGale but I seldom use it for those purposes. I prefer to do all that within the game engine where I can change sprite speeds and frames on the fly. Where GraphicsGale truly excels in that the pixel editor is exactly as it should be and does everything to save the user time. 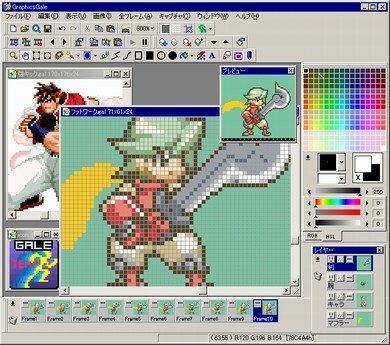 I’ve seen Youtube tutorials of people doing pixel art on Photoshop and it’s just such a cumbersome process. Photoshop is a fantastic tool for illustration and photo editing but not necessarily great for pixel art. I would even recommend MS Paint over Photoshop for pushing those pixels. The other problem with fully-featured packages is that they offer plenty of plug-ins giving lazy artists workarounds. An artist may go about drawing an object conventionally and then simply use a filter to pixelate the image. The result is often a muddy mess that is sadly passed on as pixel art. GraphicsGale will therefore not help a weak pixel artist, no such filters come available and I couldn’t be happier. The artist has no choice but to master working within limited resolution and colour parameters. With OCP Art Studio that was exactly the case, one had to make the most of the ZX Spectrum’s resolution of 256 x 192 pixels and 8 colours. Such limitations are not present with GraphicsGale but the option is given to work within various limits, some handy presets are also included. Let me stress that I don’t use GraphicsGale for any illustration work though. It’s simply not suitable for this job and there are other better options. Manga Studio is the package I use to sketch character & mechanical design and subsequent line and colouring work. The brushes in particular are the best in the business and truly aid in the creation of manga / comic book art. It’s ideal for my needs as I’ve adopted an art-style reminiscent of old school anime shows. The work of anime studios such as AIC, Madhouse, Sunrise and Tatsunoko Pro are a huge influence on me. I should briefly cover Manga Studio in a future article, even though it’s not very popular within game development circles. Mainly used by aspiring and professional manga artists who have opted to go digital. Understandably it won’t be suitable to the majority of game creators but could be of interest to those treading similar ground to me. Funnily enough I haven’t given Photoshop much love, don’t worry I’m not anti-Adobe or anti-Photoshop. Photoshop is great at what it does, I’ve just shown that there are alternatives and developers should exercise their options.